The forbidden Jade Idol is hidden in the bright lights of the city; it’s up to you to discover it and earn its ultimate riches! Click here to play! Will you find it in time? 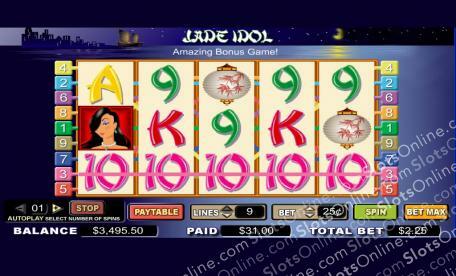 Jade Idol is an enthralling 5-reel slot that is played across 9 unique pay lines, where the more lines activated allows for more winning combos. The Monkey/Kitty symbols are Wild and can be substituted for any other symbol on the reels in order to complete winning combos. When you land one or more Kitty along with the Monkey on an active pay line, the Free Game Feature will be triggered. Skylines are Scattered and can activate the Bonus Round when the correct combination is spun up. If you are looking for large cash payouts, then land five Diamonds for a massive payout of 10,000 times your original wager. The Jade Idol is worth incredible riches, so find it for yourself today! Skylines are Scattered and can show up anywhere on the reels. Land two or more to always earn a payout, up to 100 coins per spin. Trigger the Bonus Game by spinning up a Scattered Skyline on reel one, and a Monkey on reel five.